One of the most beloved animated features of all-time will be swimming to Blu-ray in October! In an early announcement to retailers, Disney/Buena Vista is working on 'The Little Mermaid: Diamond Edition' for a Blu-ray release on October 1. 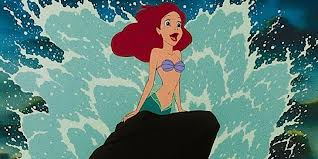 Ariel, the fun-loving and mischievous mermaid, is enchanted with all things human. Disregarding her father's order to stay away from the world above the sea, she swims to the surface and, in a raging storm, rescues the prince of her dreams. Determined to be human, she strikes a bargain with the devious seawitch, Ursula, and trades her fins and beautiful voice for legs. With her best friend, the adorable and chatty Flounder, and her reluctant chaperone Sebastian, the hilarious, reggae-singing Caribbean crab, at her side, Ariel must win the prince's love and save her father's kingdom - all in a heart-pounding race against time! Specs and supplements have yet to be revealed, but suggested list price for the Blu-ray/DVD combo pack will likely be $39.99. You can find the latest specs for 'The Little Mermaid: Diamond Edition' linked from our Blu-ray Release Schedule, where it's indexed under October 1.